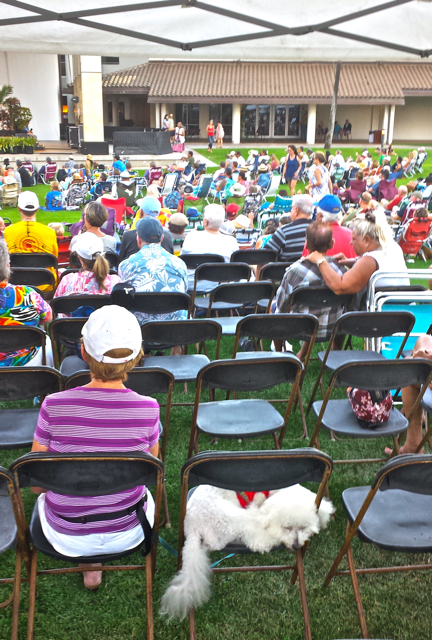 Kahului, Oct. 19–After a long day listening to music, the little dog Kea Aloha takes a nap as his master enjoys more of the same at the Maui Arts and Cultural Center./ WATCH FOR MORE COVERAGE OF THIS AMAZING EVENT LATER TODAY. Voices of Maui Talk Story/Norm Bezane photo. (Delayed for technical reasons). ical reasons). Next HOW MANY UKELELE PLAYERS DOES IT TAKE TO SET A GUINESS RECORD?